Some slots that offer bonus features. Bonus slot games are much more exciting and fun to play than regular slots. Jungle Jim Slot is a Microgaming 15 line video slot which has a bonus pick feature and a free spins feature. in addition to Scatters and Wilds, up to 10 free spins can be won when the free spins alligators surface, and flowing from that there is a choice of up to 5x multipliers that have the potential to send the win rocketing up to 5 times its original value. Elementals Video Slot is a 5 reel, 20 payline, 10 coin game, with a Wild and a Scatter symbol, and a Free Spin Bonus Feature, and a Gamble feature. This game has it all. Wild and Scatter symbols, a 20x Free Spin Bonus Feature and a Gamble feature - truly an impressive range of thrills and excitement packed into one big slot. Using bright primary colours , the theme introduces several new super heroes that represent the 4 elements of Earth, Fire, Water and Air. Hit enough Big E's and trigger the thrilling Scatter bonus with a massive 20 free spins where all wins are doubled. And within those freebies players can win another series of free spins, any one of which could generate a serious reward. The Wild feature, which substitutes for all other symbols except Scatters and doubles the win is another one to go after, whilst the Gamble feature, where a player chooses either the colour or the suit of the card - can double the return if guessed correctly. 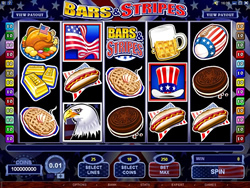 Bars and Stripes is a 5 reel and 25 payline video slot, which is ideal for any proud, patriotic American. In this slot the traditional Stars and Stripes are replaced with Gold bars and Stripes, and include icons such as the Statue of Liberty, an Eagle and an American Football. Americans love their fast food and this is evident with icons such as a Thanks Giving Turkey, Burgers & Fries, Beers, Hot Dogs, Apple Pies and Cookies. The Red, White and Blue colours of the American flag are cleverly incorporated in this slot. There is an American Flag icon and even the Spin Button is a smaller version of the Amercian flag. The Bars and Stripes icon is the Wild and substitutes all other icons, but not the Scatter icon. ?This icon will double the players rewards each time it shows up in a winning combination. 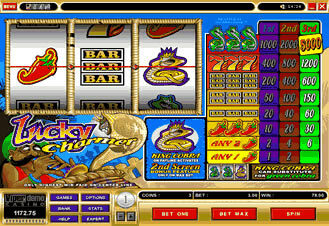 The Bars and Stripes Video Slot offer players a Bonus Game as well as a Wild Multiplier which adds excitement to the game and makes it easier for players to win. Gamblers that don’t like to take big risks but still like to win, will enjoy this Penny Slot. Players can bet for as little as $0.01 to $1.00, and the Jackpot is worth a whopping 5 000 coins. 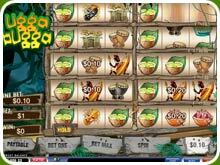 The Ugga Bugga playtech Video Slo is a 10 row multi spin slot which has an African theme featuring symbols like African Masks, Drums, Zulu Warriors and everything African. 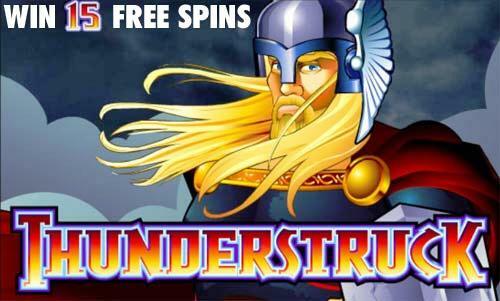 Thunderstruck is a 5 reel, 9 payline Video Slot game, with a Wild, Multiplier symbol, a Scatter symbol, a Free Spins with Multiplier feature, and a Gamble feature. The Lucky Charmer slot machine has a bonus screen where you can then choose between three different musical pipes and the charmer then plays the one of your choice. There is money hidden in all 3 baskets. 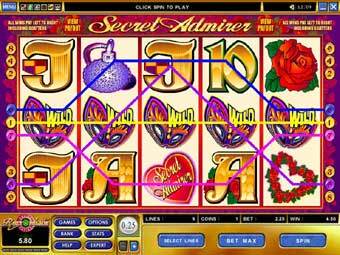 Secret Admireris a 5 Reel, 9 pay line, 10 Coin Video slot from Microgaming. It has a free spin Super Hold bonus function and a double your money Gamble Screen. The aim is to get as many diamonds on the screen as possible, and we have seen some big money won on this slot. 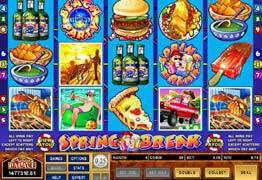 Spring Break is a new slot game from Microgaming. The best feature is the FREE SPIN Feature. If you hit three or more "Beach Party" symbols anywhere on the screen you win 15 free spins at the same bet level you where playing when you hit the feature. All wins on the free games are tripled but the wild multiplier symbol can cause your wins to be multiplied by six. A great way to really rack up those coins on the bonus games.